"These classic cookies don't get much easier." 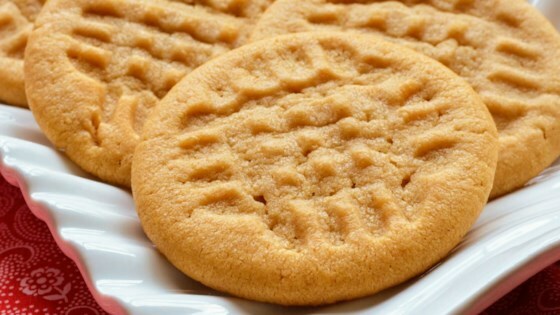 Beat butter, white sugar, brown sugar, peanut butter, salt, baking powder, and baking soda in a stand mixer until smooth. Scrape down the sides of the bowl and beater with a spatula. Add egg and mix for about 1 minute. Slowly mix in flour with the mixer on low. Scrape down the sides of the bowl and beater. Mix on medium until combined, about 30 seconds. Form dough into a ball, cover with plastic and refrigerate for 2-3 hours. Portion out cookie dough in equal-sized balls on a baking sheet covered with a silicone baking mat. Use damp hands to roll dough into smooth balls. Stamp each ball with a fork in a criss-cross pattern. Bake in the preheated oven for 10 minutes until golden. Leave on the baking sheet for 5 minutes before transferring to a cooling rack. Though an easy recipe, the texture of the cookies was grainy, entirely too salty and sweet for my taste, and not peanut buttery enough. Edible, but not really enjoyable. This is a very easy recipe. It was simple and extremely tasty! I didn't use the silicone baking mat though, i only a standard cookie sheet. I'm all about a chewy cookie and these are so chewy yet crunchy on the ouside, so good!! And simple to make too!! My Mom's recipe calls for 1/2 t. ground cinnamon ...and that simple ingredient really enhances the peanut flavor! follow recipes exactly. don't add extra butter. i also added chocolate ghiradelli powder on my second time to get rid of it. added nice kick. turned out great!